A mule deer doe that winters in the Owl Creek Mountains migrates 100 miles west to summer in the Gros Ventre Range, according to initial findings of a study that will be presented April 8-9 in community meetings on the Wind River Indian Reservation. 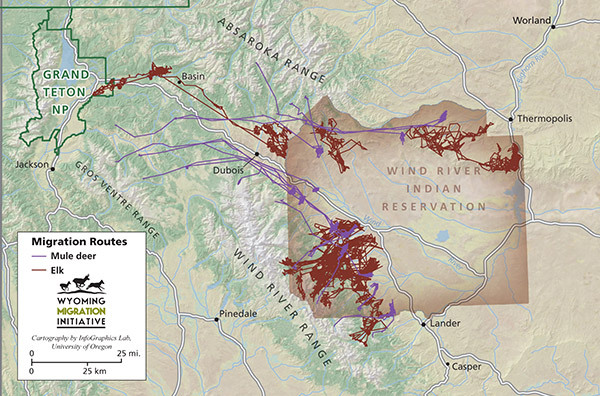 The finding shows that the Wind River Indian Reservation is connected to the greater Yellowstone ecosystem through big-game migration corridors. 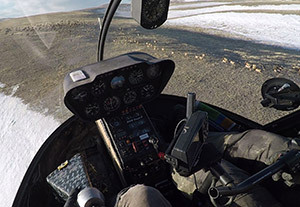 In spring 2018, Shoshone and Arapaho Fish and Game launched the GPS collar study to track elk and mule deer migration on the Wind River Indian Reservation. Shoshone and Arapaho Fish and Game, the U.S. Fish and Wildlife Service and the Wyoming Migration Initiative (WMI), located at the University of Wyoming, will host community meetings in Fort Washakie and Ethete to provide updates on the research project. Additionally, UW’s High Plains American Indian Research Institute will offer an update on its National Endowment for the Humanities-funded project on the role of elk in Shoshone and Arapaho culture. The first meeting is 6 p.m. Monday, April 8, in the Buffalo Room at Rocky Mountain Hall in Fort Washakie. The second meeting is 6 p.m. Tuesday, April 9, in the Wyoming Indian High School Tech Center auditorium near Ethete. The community meetings are open to the public, and stew and fry bread will be served afterward. Attendees are urged to call the Shoshone and Arapaho Fish and Game Office at (307) 330-3202 so organizers can get a head count for seating and the meal. The meetings will be an opportunity for community members to connect with researchers working on these projects and to ask questions they may have. The mission of the UW High Plains American Indian Research Institute (HPAIRI) is to facilitate research relationships between UW researchers and tribal communities that support and sustain tribal sovereignty, and have long-term, positive results for Native people. HPAIRI emphasizes tribal sovereignty by advocating for tribal research needs and interests in the research process, and assisting researchers in following tribal protocols. As with the 2018 meetings that launched this project, James Trosper, director of HPAIRI, says the meetings are part of that process to hear what the local communities’ interests are regarding research. At the meetings, researchers will provide updates on the migration project, which has been tracking elk and mule deer using GPS collars since March 2018. These collars have been gathering information to improve wildlife management and hunting opportunities for tribal members. 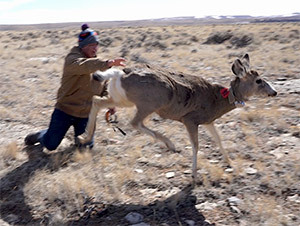 In mid-March 2019, biologists placed additional collars on elk and mule deer on winter range across the reservation, enabling them to track migration of the animals into the mountains during summer. Students from Fort Washakie High School and Wyoming Indian High School participated in the project by assisting biologists collecting data from mule deer. On a field trip, the students carried deer, helped affix GPS collars and released the animals back to their winter range. In the next few weeks, the animals will begin migrating up into their summer range in the mountains, showing their use of the habitat in a behavior long-recognized by ancestral American Indians. The migration analysis is conducted by the U.S. Fish and Wildlife Service and the WMI at UW, in close collaboration with Shoshone and Arapaho Fish and Game. Shoshone and Arapaho Fish and Game will use the data to better understand seasonal ranges and migration corridors. The Nature Conservancy in Wyoming provided funding and is collaborating on the effort to map migration corridors. To watch a video of the 2018 capture season, click here: https://www.facebook.com/migrationinitiative/videos/2076459005906030/.